Recently restored ahead of the World War I centenary, the St Saviour’s parish war memorial in Southwark was designed by Captain Philip Lindsey Clark, awarded the Distinguished Service Order for his service during the war. Unveiled in November, 1922, it features a bronze figure depicting an advancing infantryman atop a plinth and has bronze panels on either side of the plinth featuring scenes of battleships and of bi-planes. The figure of St George and the dragon can be found on the front of the plinth and a mourning woman, depicting Grief, with a baby and a dove on the rear. 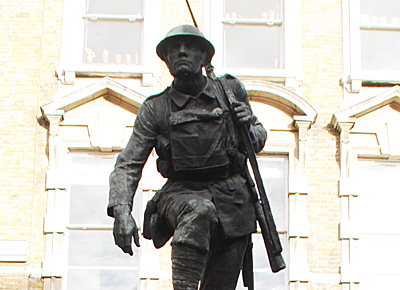 The Grade II-listed memorial, which is located on a traffic island, is dedicated to “the men of St Saviour’s Southwark who gave their lives for the Empire 1914-1918”. The recent restoration project, which came after one of the relief panels fell off in 2011, was funded by Borough, Bankside & Walworth Community Council’s Cleaner Greener Safer programme. The picture (above) was taken before the restoration. I wonder why, so soon after the War To End All Wars, the sculpture depicted weapons and killing. I think the parents of young men would have wanted images of sacrifice, peace, family ties, Christian values and honour.